In my case, medical professionals had introduced the postpartum surveys a bit prematurely. I had yet to emerge from the whirlwind of a newborn, managing two other young children, welcoming meal trains, and spacing apart our visitors. Answering the questions honestly, I had only raised one red flag in the three separate times I completed the inventory for various medical providers. My midwife was the first to take the time to address my emotional well-being. At eight weeks postpartum, I made a commitment to myself to share my heart with my husband. I also committed to taking better care of myself with a combination of more water, reading, running, less sugar, and more quiet time with God. A few weeks before my birthday, I hit a wall and found myself turning to Ephesians 5:23-33 outlining the role of a husband. The postpartum mood swings reared their ugly head in the form of anger, bitterness, fear, anxiety, and self-doubt — a cocktail of evil poisons like lava forming within a dormant volcano. It all came out at once that night, my husband listening to the brunt of my struggle. He was there to listen, comfort, and reassure me in my time of crisis. At the crux of my issues was the emptiness of not seeking Christ’s wisdom enough in this season — feeling too spread thin across the board to be any good to anyone. The bar I had set for myself was high across all aspects of my life. I wanted to give each of my kids the attention and time they craved. I wanted to be more present for my husband. I wanted to care more about my job, be more involved at my church, keep in touch with friends more, take better care of myself, and be more prayerful in my faith. There were wins — and then there were days when all I could do was meet everyone’s basic needs without leaving the house. There were weeks where we only left the house once or twice. Potty-training just wasn’t going anywhere. Everyone wanted a piece of Mommy and my tank was virtually empty. As part of an effort toward a master reset, I made a list of things that filled my tank: time with the Lord, coffee, reading, talking with my husband, exercise, and writing. There weren’t enough hours in a naptime — there never are. In that season, I was doing what I thought was enough to get by, but I was running on an empty tank while my bitterness was increasingly brewing each day. What am I chasing? I often asked myself. I wished there was someone who could understand me exactly. God does. God knows my anxious heart, and He knew it in that season as well. My husband removed a huge burden when he reminded me to take my anxieties to the Lord in prayer. He disclosed that he had been very scared of losing me in childbirth, as things unfolded so quickly. I never knew he had shouldered this tremendous fear of losing his wife and new baby. I can’t imagine how terrifying that must have been for him. He is so incredibly steady that I had never even sensed his worry. I swallowed my pride and called on my tribe that week — my husband, my best friends, and my parents. One friend watched my children and planned a playdate for our kids, as well as a coffee date for her and me — which served as much needed adult conversation for me. Another friend watched my children so that I could catch up at work. My parents also stepped in to watch my boys to allow for another day to catch up at work. Another close friend made sure that I was never without scripture. God, I lay down my anxious thoughts, my self-doubt, my questioning. My fears. My what-ifs and what will I do’s. What a long season you have given me. Four pregnancies, three babies, a new house, new job, new school. Two moves this year – one at home, one at work. A homebirth-to-hospital transfer. I’m ready to be settled. I’m so blessed by your gift of a new baby. He has changed me. I am humbled by him in so many ways as I consider your miracle with him and his delivery, and how I’ve had to ask for help in this daily struggle. Amen. I needed help, but I didn’t know how to ask. A trained counselor of nine years, a certified “mental health first-aider,” and I remained at a loss. I knew how to keep myself safe, but my anxieties were at a record high. The six-week mark had already passed and I was certain my window of getting help had already closed. Dear friend, it is never too late to ask for help. In my case, admitting to myself that I needed to get help was harder than asking for it. In fact, relief was delivered the moment the nurse answered the midwife’s phone. I told my story and expressed my concern. She calmly took the lead — validating the severity of my situation and never doubting me or overreacting. She had seen this hundreds of times, no doubt, and she knew how to connect me to help immediately. I was relieved. But this relief is just the tip of the iceberg compared to the relief we experience when we cast our anxieties on God’s shoulders. Before the new baby, I felt fully capable of managing two children. I was thriving, in fact. I managed a blog, ran marathons, worked a full-time job, had time with my boys and my husband, and I took care of myself. My kids had activities and my husband and I had hobbies. We managed to keep all the plates somewhat in the air. The hardest part of our transition to three children was admitting that I could not manage everything on my own and accepting that I would have to settle for a lower standard than I was used to maintaining. I had to learn to ask for help. It was at this lowest point, on my 33rd birthday, that I vowed to God and to my children that Mommy was going to change. My story propelled me to plug back into my community. I joined a Birth Matters local chapter. 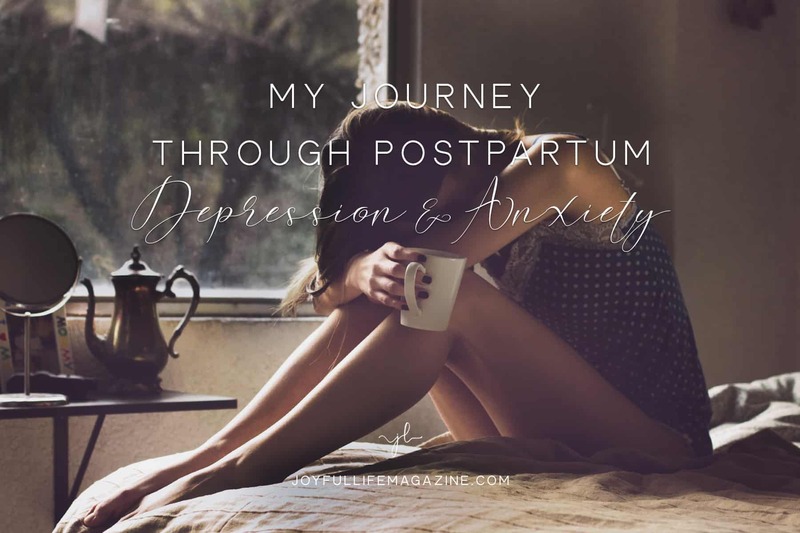 It helped me connect with other moms who’ve experienced postpartum anxiety, as well as other forms of anxiety, even if we didn’t have the same experiences. Unexpectedly, this struggle that I initially bore in silence eventually helped me to empathize more in counseling my students — many of whom suffer from anxiety-related disorders themselves. One of the greatest blessings that came through this season of suffering was a new gracious outlook toward myself and other moms. We’re all just doing our best. If you find yourself treading through the unfamiliar darkness of depression or anxiety, I encourage you to find that friend who will do life alongside you, that person who won’t gloss over the scary trials that come. It helps to talk to a friend who will truly listen. Avoid conversations where someone is trying to “fix” your problem by giving advice or commiserating by turning the subject back to her own heartache. A friend won’t brush off your story as trivial by implying that you’re overreacting to everyday circumstances that everyone faces. Toward the end of my maternity leave, I slowly began taking my life back, doing my best to keep just one step ahead of my boys. I committed to staying on top of washing cloth diapers, maintaining the laundry , and prioritizing much needed playdates with good friends. More importantly, I committed to spending quiet time with God. I learned to ask my husband for physical help and to ask God for energy, stamina, and spirit. I also sought strength from the Lord in demonstrating grace, discipline, and consistency to a two-year-old who — it took me months to learn — best responds to a loving touch. I recall the first time I managed to get all three boys down for a nap in 18 minutes — I felt invincible. That seemingly small victory was, in fact, a tremendous gift reflecting God’s slow work and persistence during that season. He presented me with a struggle and then graciously brought me through it. There was a reason he had placed this third boy in my life. It isn’t going to be perfect, but who expects perfection? Not God. After a season of processing through my postpartum journey, my hope is that sharing my story of floundering amidst such extremes of emotion will encourage other mothers who find themselves in similar seasons. My sincere prayer is that struggling mothers will allow themselves permission to pause in a world that champions hustle. Ashley is a wife, mom to three small boys, and an elementary school counselor in the beautiful Shenandoah Valley of Virginia. She writes @TendingWild on Instagram and blogs at ashleybartley.com, where she encourages moms to create a habit of pause in every small, great, and wild moment. Love this honest and transparent post! I suffered from PPD with 2 of my births and developed an anxiety disorder after one of them. Awareness is needed! No woman needs to feel alone when she suffers from PPD! Thank you for reading, Julie! I’m sorry to hear that you faced this as well with 2 of yours! Thank you for reaching out! You’re exactly right! Thank you for this! I’m a fellow counselor who had a baby a year ago. That quick postpartum questionnaire passed to us just before discharge just isn’t enough. I’m sure it flags some patients as a risk, but for many we’ve not hit the reality of being back at home, with our responsibilities. I’m glad that there is a move to have a postpartum visit to the doctor sooner than later–I believe ACOG is looking to change the first postpartum visit to 3 weeks instead of 6, but there are still other measures that would be helpful. Thanks again for sharing! Thank you, Laura! Yes, I wish mine had been more spaced out — all 3 were right at the 6-week mark! Happy birthday to your little one! From the first time I met you… I knew you were amazing! Thank you for sharing your story… I went through this with my youngest. Back then it wasn’t talked about much. Thank God He never leaves us! Carrying us even when we need Him most. Thank you for reading, Kathy, and for your sweet words! I’m so sorry that you went through this. You and your girls are wonderful and such a blessing to so many people!